The PRO-AM is superior in terms of construction, quality, and materials, but most importantly, the playability is second to none. The main difference is the one-piece slate design featured in 7ft, 8ft, and 9ft models. 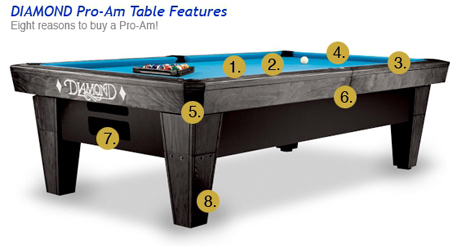 The PRO-AM has rapidly gained the respect of the professional, amateur, and casual players everywhere. DymondWood is burn and dent resistant! Poplar wood is used in the front of the rail to glue the cushion rubber directly to the sub-rail. Poplar accepts staples easier than other wood types, when covering cushions with cloth. 1/4” feather strip channel is cut into the top of rail for securing cloth over the top side of the cushion then stapled to the bottom side of the poplar wood. Call 07821 125 582 or multiple table discounts with or without matching light units and special pricing on Tournament Used Commercial tables (when available). 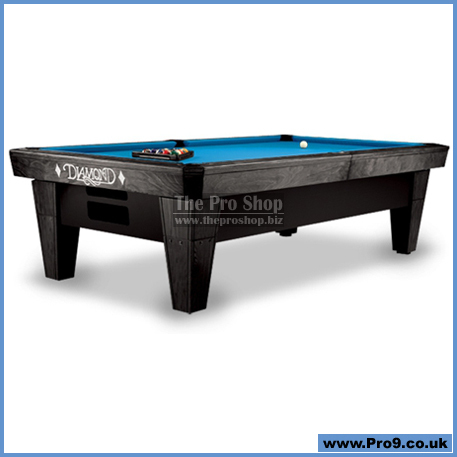 7ft, 8ft, and 9ft table are equipped with 1" 1-piece slate. Unique Dymondwood that is burn and dent resistant. Phenolic resin pressed into the material gives the wood its durability and luster. Dymondwood is available in 4 different colors; Rosewood, Charcoal, Walnut, and Golden Oak. Tour specified K-55 profile offers quick response. An additional 1/4" top rail backing wood has been engineered between the cushion and the feather strip channel to provide consistent rail speed. Leveling block is built right into the leg of the Pro-Am. As the 3/4" nut is turned, each leg can be raised or lowered with ease for precise leveling. *Price is for a single table. ***Discounts are available for multiple table orders. 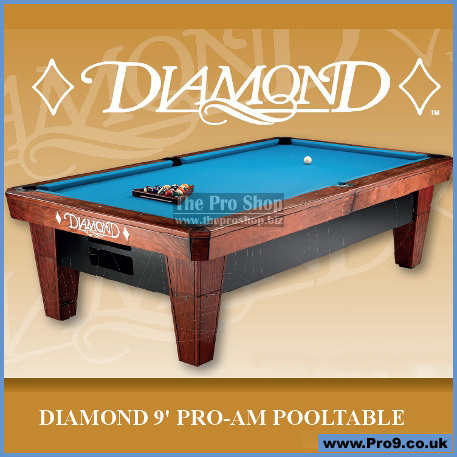 ****Tournament Played Pro-Am Table Pricing - When Available.